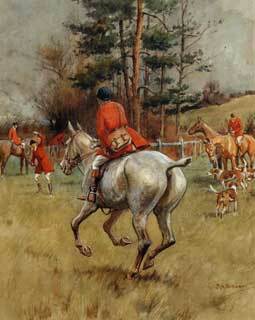 The Bicester & Warden Hill by FA Stewart. Original watercolour signed in ink. c.1920 5x9ins. Framed in 1" gold. The Heythrop, at Ilbury Gorse by FA Stewart. Original pencil signed and FATG blind stamp. Published by Vicars Brothers. 15th November 1934 14x28ins. Framed in 1" blue & gold. 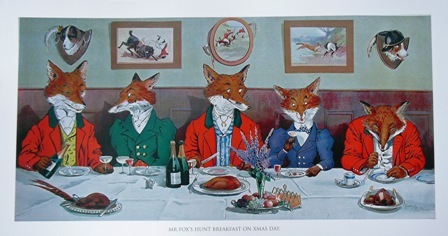 These are all original colour prints from his three books, Hark to Hounds, Cross Country with Hounds and Hunting Countries. 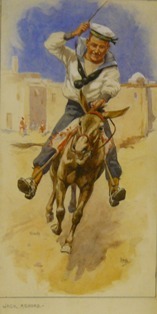 They all come framed in 1/2 inch gold frames with a cream mount and measure approximately 6x12ins. They were published in 1935. They make a very hansome gift at an affordable price.